Cranes are a marvel of engineering, and an essential component of many industries including construction, manufacturing, warehousing, and more. Operating a crane takes extensive training, and following set standards to ensure both the crane operator, and those in the surrounding area, are safe. Crane safety is an important component of overall workplace safety, and doing it right can mean the difference between life and death in many cases. Having a detailed crane safety program in the workplace is an important step for all employers where cranes are used. This can start by identifying potential crane related hazards, and continues with finding ways to eliminate the hazards, or compensate for them in some way. All workplace safety is important, but crane safety in particular is critical because of how devastating accidents related to cranes can be. The following are some key areas that should be included with any good crane safety plan. Electrical Hazards - Cranes operate at great heights, which puts them in a terrible position for accidently hitting electrical lines. The metal in the crane is an excellent conductor, and can cause fatal electrocution. Crane operators must be aware of where every electrical line is at all times. Materials Falling - Every load that a crane lifts needs to be properly secured. But even when the loads are secured, there is always a risk of something falling off. Those below the crane should avoid working in the area, and wear hard hats and other appropriate PPE when it is unavoidable. Overloading a Crane - Cranes can lift an astounding amount of weight, but there are limits. Crane operators, and those that load cranes, need to know precisely how much weight it can handle, and exactly how much weight they have added at any given time. Overloading a crane can cause it to tip over, or to drop the load, which can have devastating consequences. Crane Movement (pinch points) - Cranes often need to twist or move to get the load where it needs to go. This can create pinch or crush points where someone could be seriously injured. Dropped Loads - If a crane drops its load, whatever is under it will be crushed. Even vehicles or structures can be crushed from the impact of a heavy load dropped from a significant height. Nobody should work directly under a crane load for any reason, even with PPE. Tower Crane - Tower cranes can reach very high heights (265+ feet) and are commonly used in construction of skyscrapers or other buildings. These cranes can be secured at the ground, or attached to the top of a structure to aid in its completion. Gantry Crane - A gantry crane is fixed in one spot and gets support from the structure it is fixed to. These cranes are common in places like trainyards, shipyards, and factories. Rough Terrain Crane - Cranes equipped with treads rather than tires are important for construction sites with unpaved or otherwise rough terrain. It is critical to ensure the crane is secured safely before loading it to avoid accidents. Aerial Crane - An aerial crane, or sky crane, is attached to a helicopter. The wind caused by the helicopter makes securing loads properly especially important. Floating Cranes - Cranes that are based on a ship or platform in the water are known as floating cranes. In some cases, these cranes can be unstable due to waves, which must be taken into account when planning for their use. Vehicle Mounted Cranes - A crane can be mounted on a vehicle to make it more mobile for easier use. In most cases, the vehicle will be a large truck equipped with heavy outriggers to stabilize the crane while it is in use. Making sure that a crane is in proper working order before it is used is essential. If anything isn't working right, it can cause serious accidents and injuries to those in the area. All crane safety plans should include a crane inspection list that the operator (or other designated individual) will need to go through before operating the crane. Hook - This category will check things like the opening of the hook, checking for cracks or corrosion, how much wear is on the throat, and other details. Wedge Sockets - Looking at the wire rope size, the dead end of a wire rope, and ensuring the wire rope is properly secured. Sheaves - Check to ensure the wire rope is seated into the sheaves, that the keepers are in good working order, the bolts are tightened correctly, and for any signs of damage or wear. Boom - Look for hydraulic leaks, watch for lattice extension issues, and check all around the boom for bent, buckled, or cracked panels. Fluids - Checking all the fluids in the crane to ensure they are at the necessary levels. Tires - Tires must be inflated to the required levels, and should not have any cuts, bulges, or signs of wear past the normal expected life of the tire. Other - Any other things that need to be checked on a given crane before it is operated. A crane inspection list can either be printed off on paper, or a digital version. Someone should actually check off each section of the list signifying that they have been checked before the crane is put into use on the jobsite. Identifying and eliminating hazards related to cranes is very important, but no matter how much effort is put in, it is impossible to make cranes 100% safe. To help ensure employees are protected should something go wrong with a crane, it is a good idea to require personal protection equipment (PPE) for those working on or around a crane. The following are some basic requirements for PPE around cranes, but additional equipment may be necessary depending on the situation. Hard Hats - Everyone working on or around a crane should be wearing a hard hat at all times. It is impossible to predict when something could fall off a crane, and even small objects can cause serious head injuries if no protection is in place. Eye Protection - Crane operators need to be able to see what they are doing at all times. When working in an environment where dirt or dust or other things are present, it is a good idea to wear protection to avoid eye irritants that could cause a temporary vision issue. Hand Protection - When loading or unloading a crane, it is important to keep hands safe from pinches or being crushed, wearing protective gloves can reduce this hazard. Looking at the specific hazards associated with a crane, and the load on the crane, will help to determine what types of PPE are necessary. Each jobsite, and each load, may require a different type of protective equipment. Letting people know that a crane is in use (or may be in use) in a given area is an important part of ensuring they are safe. 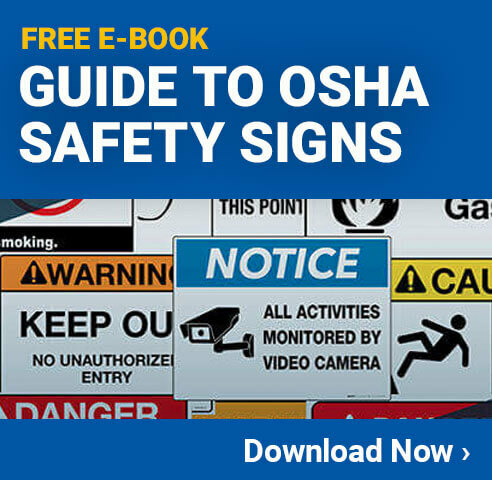 Using crane safety signs is very important, and in some cases, may be required by OSHA or other regulatory agencies. These signs can be effective both for alerting people of the dangers, and instructing unauthorized individuals to stay out of the area due to the hazards. Offering all employees who work on or around cranes training is a great way to minimize the risks associated with this type of equipment. This training should be required before the employee works near a crane not only for their own safety, but for the safety of others in the area. There are many ways training can be provided including through crane safety videos, training provided by an expert, and more. 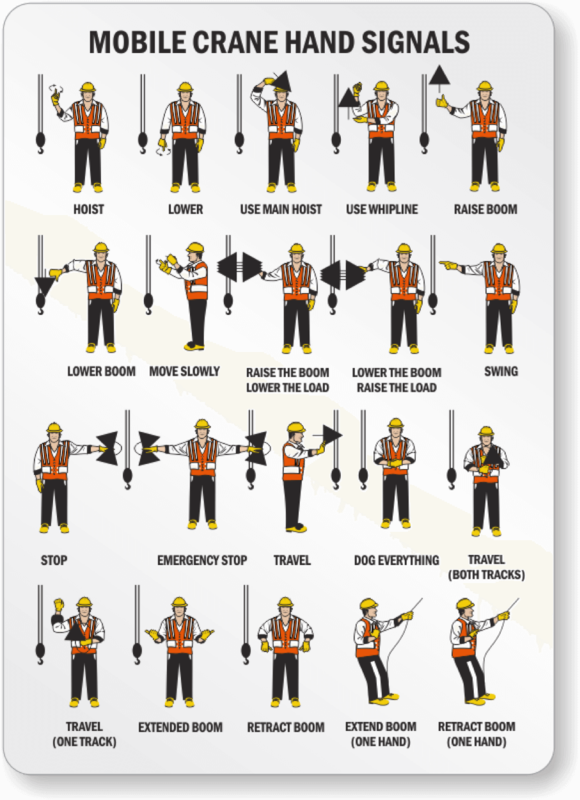 Part of the training that should be provided is the standard crane hand signals. These hand signals can be used when other communication is not possible. Ideally, the training should be customized to match the types of cranes that are used in the workplace. If multiple different types of cranes are used, information about each of them should be shared in such a way as to ensure everyone understands the specific hazards of each specific crane type.